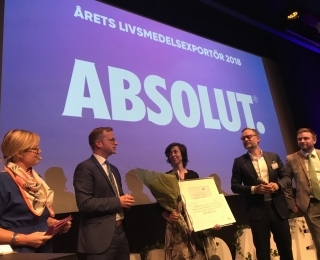 With its natural, authentic flavour, forged through a know-how that dates back 30 years, and its iconic packaging, inspired by an 18th century apothecary bottle, Absolut is recognised the world over for its pureness and taste. Rich, full-bodied and complex, yet smooth and mellow, Absolut offers a distinctly grainy flavour with a hint of dried fruit. Absolut Citron is made exclusively from natural ingredients and it doesn’t contain any added sugar. Absolut Citron is smooth and mellow, with a fresh fruity lemon and lime character and a note of lemon peel. Absolut Mandrin is made exclusively from natural ingredients and it doesn’t contain any added sugar. It’s complex, smooth and mellow with a fruity mandrin and orange character mixed with a note of orange peel. Absolut Raspberri is made exclusively from natural ingredients and contains no added sugar. The fresh and fruity character of raspberries blends perfectly with the other flavours. The main ingredients in Absolut Vodka are water and winter wheat. The water is drawn from a deep well in Åhus where it is protected from impurities. With minimal use of fertiliser, winter wheat is sown in autumn and harvested in autumn of the following year. Throughout the year, the wheat grows under the Swedish snow and sun, developing its robust husk. Distilled over a hundred times, Absolut Vodka is exceptionally pure, containing only natural ingredients and no added sugar. In 1879, distiller Lars Olsson Smith, nicknamed “The King of Vodka”, introduced continuous distillation from which he created Absolut rent bränvin (“perfectly pure vodka”). Instead of the usual three or four times, Olsson Smith distilled his vodka over a hundred times – a method introduced by Absolut a century later. Today, Absolut Vodka is produced in Åhus, the birthplace of Olsson Smith, from wheat grown in the same area.